Workshop 2018 - Conference and Awards Ceremony "Valuing the expertise of people living with dementia"
Who is involved: The guidance was developed in conjunction with the Alzheimer’s Society and the Department of Health. It had collaborative input from organisations including Age UK, the Dementia Action Alliance (DAA) and Public Health England, and included input from people with dementia and their carers. One of the members of the Steering Group was a person living with dementia. Nature of activity: BSI is a national and international standards organisation. 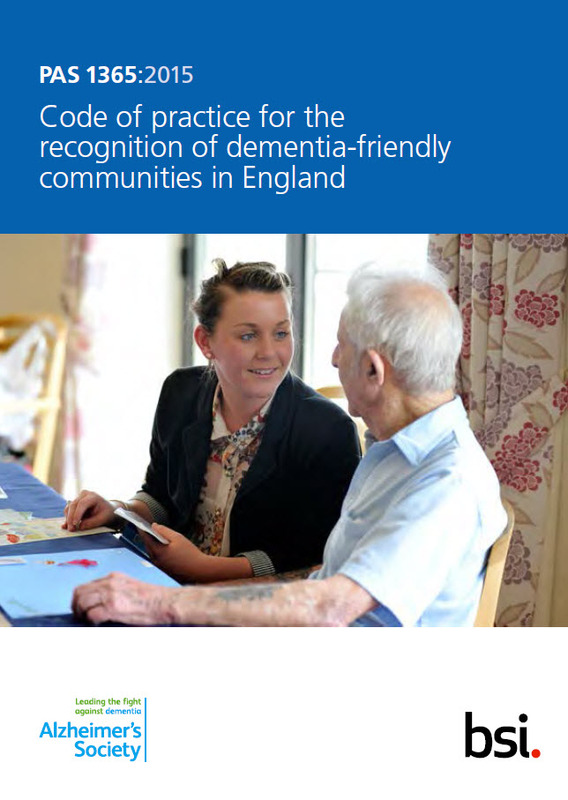 It has produced a national standard to support the recognition process for ‘dementia-friendly communities’. Publicly Available Specification (PAS) 1365 will support the continuous development of communities in accordance with the behaviours and characteristics defined by the Alzheimer’s Society. The PAS covers who should be involved, how to engage stakeholders, and areas of or action to develop a ‘dementia-friendly community’. It is aimed at local government, business, health and social care organisations, and NGOs. The development process included a public review where comments were received from a variety of organisations in the sector, including care homes for people living with dementia, carers’ associations and residential care organisations. Click here to download the Code of Practice or visit the website below.